Except for a couple of comfortably chilly mornings, the weather outside wasn’t particularly frightful. In fact, it was rather comfortable, perfect for walking around the Christmas markets in Germany in early December with neither hat nor scarf. And even that little early nip in the air didn’t have much of an impact on me — the central train station I needed every day was a 15-second walk from the front doors of my hotel. Spend a silent night or two in your comfortable room. Built in 2003, the Steigenberger Metropolitan Hotel in Frankfurt occupies an advantageous location directly across the street from a side entrance to the hauptbahnhof, Germany’s busiest rail station that opened in 1888, with a beautiful façade topped by a struggling Atlas — the perfect spot to accommodate my peripatetic itinerary that would take me to six other German cities in as many days. Past the joyful Christmas tree and the sleek lobby with the first of four Advent candles lit, the long Metropolitan Bar & Lounge provides a comfortable spot to wind down your day with a nightcap before heading up to your room. My top-floor room was simply decorated and designed for comfort, whether I wanted to get snuggly in the provided robe and slippers, soak in a long tub with bath salts in the bathroom with double vessel sinks, or watch a Christmas special on the high-def flat-screen television and settle in for a silent night. Every morning, I would fill up on the hotel’s generous continental breakfast — a wide variety of cereals, breads, and spreads; cold meats, cheeses, and vegetables; juices and smoothies (the cherry one was cheerfully tart); yogurts and fresh fruit. A tempting selection of made-to-order hot breakfasts was available, too, and on the one morning that I had time enough to enjoy it, the eggs Benedict with a side of Munich weißwurst didn’t disappoint, and the tea — a creamy vanilla-orange blend — was the best I’ve had in a long time. Every evening, I would return home from a different city, energy (and many euro) most happily spent and laden with a couple of bags of handmade ornaments and decorations. I would enter my room to find that the staff had already performed turndown service, and a little treat would be waiting for me on my pillow — a chocolate-covered pretzel, a small package of gummy bears, a box of two Lindt champagne truffles. 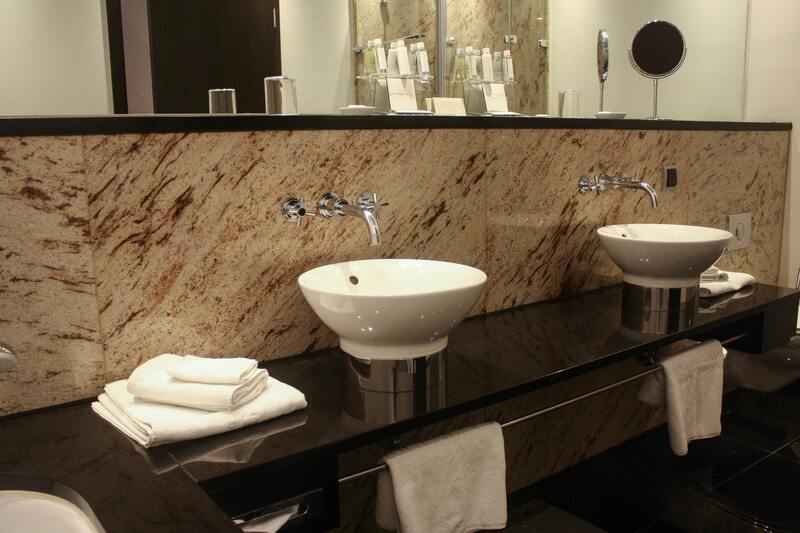 A spacious bathroom features lots of warm marble and double vessel sinks. Most days, I snacked my way through the markets, enjoying a bratwurst with mustard here, some spätzel there, perhaps some nussstrudel or a mug of glühwein. But I saved my appetite on the last night for a meal in the hotel’s Brasserie M. Served by a waiter with very refined skills, the nutmeg-pumpkin soup with honey and olive oil, and a plank of crispy Serrano ham leaning against the bowl, followed by grilled salmon with fennel-saffron vegetables, and mashed potatoes with olives, constituted the best meal I’ve ever had in Germany. 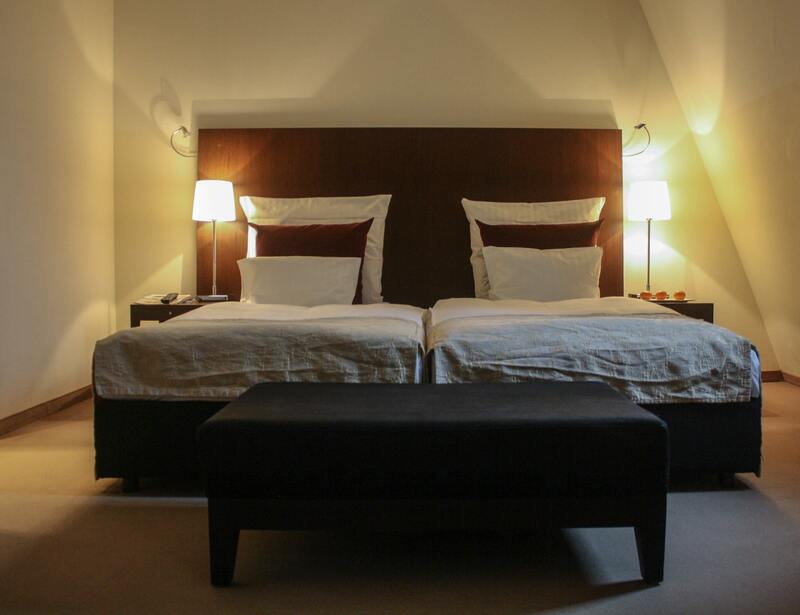 Even if you don’t need the convenience of the train station across the street, the Steigenberger Metropolitan is still in a terrific location. The downtown financial district, the gorgeous old opera house, the Main River, several museums, three Christmas markets, and plenty of shopping all lie within an easy walk. And when you’re ready to head to the airport for your flight home, a taxi stand is right next door.